The family name has become synonymous with faith, perseverance and most importantly, winning. A rarity in most forms, world-class athletics has become the standard for the Curry family. Whether it’s Dell with his 16 NBA seasons, Sonya and Sydel with their success in volleyball, Seth with play at Duke University, Stephen with a Most Valuable Player and NBA championship or Riley showing up her dad at press conferences: the Curry family is as successful of a family as you’ll find in sports. The success doesn’t mean that they’re anywhere close to done, however. If you’ve been paying any attention to Summer League, the often forgotten brother of the MVP, Seth, is preparing his own professional campaign after numerous attempts to stick in the league. The Curry name has been both a gift and a hindrance for the 24-year old. Always compared to his older brother, Seth is constantly associated, repeatedly asked and never away from the shadow of the successes of his sibling. He wants to change that, and with his stellar play in Summer League – leading all players with 25.3 points on 49 percent shooting in 32.5 minutes per game — Seth is well on his way towards the first guaranteed deal of his career. On a scorching Thursday afternoon in Las Vegas, the determined Curry met me with a particular strut and noticeable confidence. He had a game just two hours later, and the focus was evident. He proceeded to score 26 points on 12-of-21 shooting in 33 minutes, adding six rebounds, two assists and four steals against the Washington Wizards. This has become a customary line for the thriving Curry, who is performing in the ideal situation for himself and his game. There hasn’t been a more impressive player in Summer League than Curry, and with a matchup against the Golden State Warriors – a team that previously cut him – set for Saturday, another way to prove his doubters wrong soon comes. Of course, if Seth had it his way, the doubters will continue to be proven otherwise. That’s been the Curry way, and his path has never been clearer. He’s becoming much more than a shadow of his father and brother, instead creating his own for others to follow. How has the D-League helped your game? You know progressing there? It’s given me the opportunity to play with the ball, a lot of experience playing in the NBA system and just being on the radar of NBA teams. Staying close and let them get a close look at me. Do you think it’s a legit way to progress your game? Going in there and playing against those guys. It depends on your situation. Some people can go in there and not have the right system for them and not get the right amount of playing time and things like that. It can be good. For me personally, it’s been great. I had a great opportunity to play in the right system for me and get the minutes that I need, so it has been good for me. Why do you feel you’ve been overlooked so far? I don’t what it is to be honest with you. I mean, I feel like I play well throughout the years, but I still need to find the right opportunity for someone to give me the chance to get on the court and actually play. I haven’t lost any confidence in myself or anything like that. So I’m sticking to it . Was there a particular situation where you felt close to signing? Yeah, I felt a couple of times when I got signed and called up in the middle of the season. I felt like I was going to get the opportunity, but you know stuff didn’t work out where I actually did get the opportunity to play. I mean you never know. You got to get kind of lucky in my situation to actually get a chance. Did you ever think of playing overseas, or was it always the NBA? I mean, it’s always an option, especially getting big offers and big deals overseas. Just hearing feedback from teams telling me I’m close and they like what I do is enough for me to stick around right now. We’ll see what happens going forward. Why has Duke had such an influx of talent in these recent years? I think coach has done a great job recruiting wise. I mean obviously getting a guy to buy into what he is doing over there and his system and using the USA opportunity to show how he can get guys ready to play the NBA system. Guys want to come in and win. If they’re going to be in college for a year or two, they want to come in and win right away and play with other good players. It doesn’t hurt to be on the ESPN stage every night and playing, that’s always exciting. You hear so much about how important college coaches are to players’ careers. What about Coach K makes everyone enjoy their time with the program? First of all, he’s a proven winner. He knows what to do to win games. He’s competitive. Even at his age he still has that fire that most coaches don’t have. He’s had all types of different players: guys that are one and done, four-year players that have been in the NBA, guys overseas for a while and things like that. He’s seen it all. His system isn’t trained for any one type of player. He’ll change his offense around his best players, so that’s always good. You’re currently leading Summer League in scoring at 25 points per game. Are you playing the best basketball of your career? No, not really. I feel like I’m playing like I usually play in my normal game. I’m not trying to force anything. I’m just playing how I play and it’s working out right now. So, hopefully I continue to keep it going. Are you looking at this Summer League as a place to work on your game? What are you looking at to improve most during this summer? I work on my game before Summer League. I’m just working out and trying to put my skills on display, things I’m confident with. Coming out in games, I’m not going out in the games and working on things that I know I’m not comfortable with right now. People are watching, so I just go out there and do what I know I’m good at and when you go back in the gym on your own, that’s when you can start working on things that you want to improve on. I know you’re working with Johnny Stephene and #HandleLife. What specific things are you working on with your game right now? Offensively, just being more creative off the dribble, making plays in one-on-one situations and pick-and-roll situations. I think I’ve showed that so far. Defensively, it’s hard to work on that stuff, but I’m just watching film and just focusing on it, even when you’re playing pickup and here at Summer League. 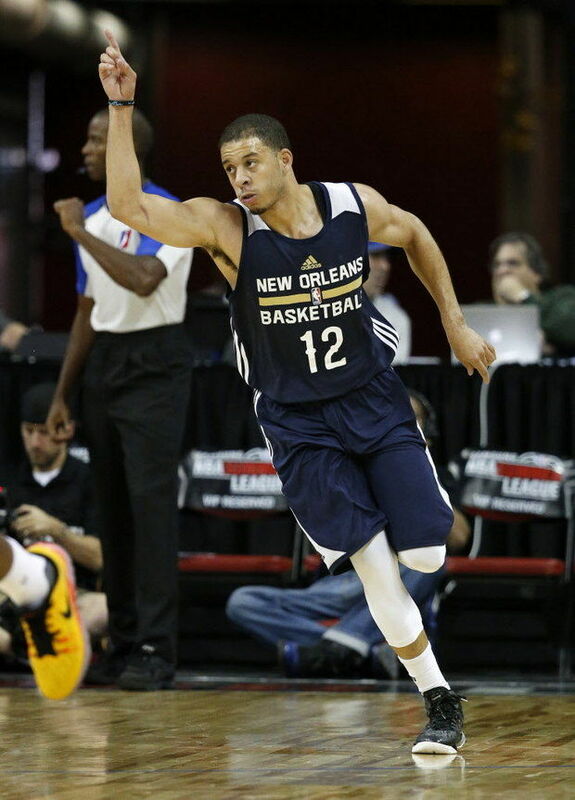 You’re with New Orleans and their Summer League team right now. How much have you talked with Alvin Gentry? We’ve talked a good amount about how I can fit into his system, the team and giving them the points they didn’t really have on the roster last year. It’s been looking good so far. I’m just going out there and doing what I do. They like me for a reason and I’m just going out there and proving that every day and just playing with that chip on my shoulder. I’m going out there and proving that not only to the Pelicans but every other team in the league. What is it about Alvin and his system? Watching how the Warriors played last year in that system, what gets you excited about potentially playing for him? First of all, the pace is up-and-down and fast. It’s fun to play in. It’s a lot of space, especially guys that can shoot the ball. He’s used to having guys that can really knock it down on his team, that’s something I can bring to him and I’m trying to go out there and show how I can do that at the NBA level. It’s always fun for guards to have the opportunity and freedom to play their game and not be afraid to make mistakes. Riley [Curry] was a big deal during the playoffs. How was it seeing all the reaction and some reporters even saying she shouldn’t have been in the room? That was the dumbest thing I’ve heard in a while: guys complaining about a 3-year-old being with their pops. It’s crazy, but that’s who she is. That’s how she is at home and wherever she goes. It’s good that people get too see how she is and her personality, but you don’t want to get carried away with having a 3-year-old getting all that attention. They do a good job of not letting it get out of hand. When’s the last time you had a shooting contest with both your brother [Steph] and your pops [Dell]? We haven’t had one this summer, so probably last summer. I’m sure we’ll get around some camps before the season starts and shoot in front of the kids. I don’t know what happened last year. I don’t even remember what happened last time. I just remember that my dad beat Steph when they played at his camp a couple weeks ago. My dad won. He has the crown. I’m always listening to Drake and stuff like that. Future is hot right now, so I’m always bumping him. I like R&B too. Someone hands you the aux cord: what are songs that you are picking right off top? I’m just letting all the Future mixtapes roll and then probably some R&B stuff. The Future mixtapes are definitely dominating though. I loved this: “That was the dumbest thing I’ve heard in a while: guys complaining about a 3-year-old being with their pops…” The thing I immediately noticed with Steph and Riley was that he was a dad who knew his daughter and didn’t just trot her out for a press conference. We all know everyone who complained had their eyes and camera glued to Riley the whole time she was there. Sure, the reporters had serious questions to ask, but their readers loved that little girl possibly more than anything Steph had to say.